Something to keep in mind as the government continues to implode upon itself. Here's to hoping that the more sane among the Republican Party move to end this silliness in Washington D.C., especially as the debt ceiling extension looms large. I've heard the talk radio types downplaying the impact of the shut down (I actually heard a Mark Levin segment where he basically implied that the shut-down was actually a good thing), but make no mistake about it: there is nothing spin-able about a federal government default. Yes, I'm calling for a revolt...against the Tea Baggers. 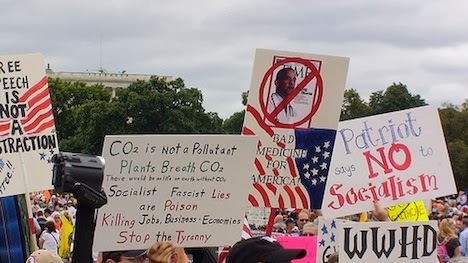 For the record, unless the Tea Bagger in question is actually an asparagus, then I'd like to see him/her breath just CO2 for about 15 minutes and then tell me it's not pollution.